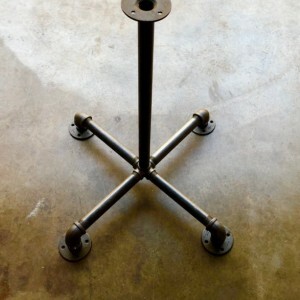 Black Pipe Table Base "DIY" Parts Kit, Pedestal Table Base, Pub, Bar Table,1" Pipe x 28" Tall, 24" Wide Base Pedestal Pub table frame. Sturdy construction which will easily hold up to 200 pounds. Simple industrial design yet made with construction grade pipe that will last for years. 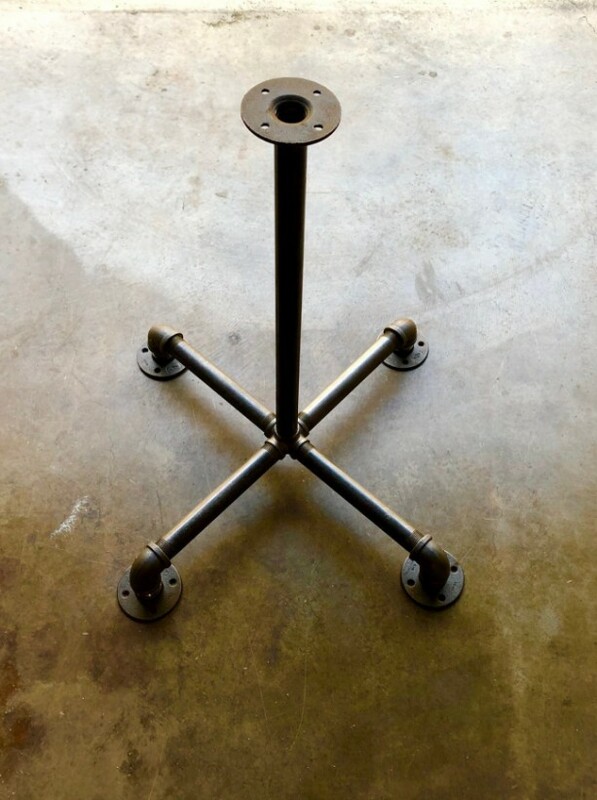 Black Pipe Table Base "DIY" Parts Kit, Pedestal Table Base, Pub, Bar Table,1" Pipe x 18", 24", 28" or 40" Tall, 24" Wide Base If this frame doesn't quite match up with your table top we can customize a table leg frame for you. Message me your specifications and I'll send you a quote. Authentic Black Pipe (used in industrial construction). It is recommended that all pipe and fittings be cleaned prior to assembling. Just add your top and screw to the base flange once you have cleaned and assembled the pipe frame. The Black Iron Pipe table base in raw iron pipe gives the coolest, most contemporary look to your tabletop. If you want a rustic and Industrial or Steampunk style in your home, then you should buy this table frame. The frame is delivered unassembled in 1" pipe and fittings is easy to screw together by hand or with a pipe wrench. Follow the trend and create your own personal table by selecting a well-designed Industrial Pipe frame for your DIY tabletop. With a set of Pipe table legs you are bringing one of the most popular and trendy details into your home and adding a modern and stylish look. Our forged iron table legs are stylish, elegant and suit all kinds of tabletops. We have developed our table frames with a focus on a stylish look and great functionality. The holes in the top of the table legs make it easy to mount on wood and the threaded pipes are adjustable for uneven floors. With the Pipe Design table legs/frame in iron pipe, you get a super flexible and extremely durable solution. The model is available in 3 different sizes, but is also offered in special sizes and can therefore be used for everything from dining tables, office tables, and coffee tables to high tables and computer tables. The table legs in the Pipe Design in raw iron gives a raw and industrial look.Please reference the Q & A section in my Etsy shop for instructions on cleaning and more details regarding the black pipe products sold in my store.